My post today was suppose to be about vegetables. Grilled vegetables to be exact. But no vegetables were grilled. More on that later. Instead I invite you to have a bite of those ricotta cheese and dill rolls. 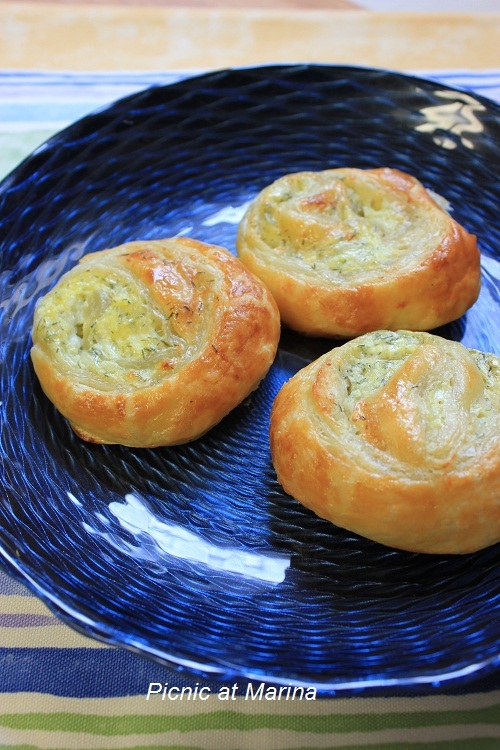 They are very easy and quick to make: one package of puff pastry, a cup of ricotta cheese, one egg, a tablespoon of dill, a little salt. Mix all together, spread the filling on the dough (package of puff pastry usually comes with two sheets of dough, so the filling is enough for both), roll it, cut into 1/2 inch pieces, brush the top of each "floret" with egg wash, and bake 15-20 minutes in 400F oven. I call it an emergency feast when I have to change my dinner plans and make something really quick but somewhat fancy. The filling can be sweet or savory, better yet make one sheet savory, and another fill with jam to make a dessert. Possibilities are endless here! Usually I don't go for a store bought dough, the only exceptions are puff pastry and filo dough. I am in the process of mastering my puff pastry. I've done it twice and it's a long and labor intensive way that requires more practice. I am learning from Julia Child's book, where folding butter in the dough, then cooling, then folding again is required. If you know any shortcuts, please, do share! These rolls look delicious, great photo! Yummy. Do you buy frozen puffed pastry and filo dough? I bet these are incredible! My mouth is watering just looking at it! These look fantastic, I can see how they could have endless variations! I've done puff pastry from scratch and yes it is very labor-intensive. It's delicious but usually I don't have that much time to spare. Frozen puff pastry is just fine with me! I love easy recipes like this! I don't do enough with puff pasty - it's such good stuff. I've never made it from scratch, but Julia Child certainly is thorough in her instructions (I believe she also has an easier, "mock" version - you don't need to do all the folds - but the original is probably better). Funny, I've been thinking about learning to make puff pasty (one of the great things about blogging is it gives you an incentive to do all of those back burner ideas that you'd otherwise probably never get around to). My goo-to quickie meal is a quick bacon pasta sauce. Put enough water on the burner to cook the pasta. Meanwhile dice a medium onion and a couple of cloves of garlic - put in a pan to very lightly brown. Slice up about 1/3 to 1/2 pound bacon. Brown in another pan. Add crushed tomato to onions plus seasonings (red pepper flakes are god). Right about now the pasta water should be ready - add a pound of tubular pasta like ziti. Also right about now the bacon should be browned - drain (or not) and add to the tomato. When the pasta is done, so is the tomato sauce. (The tomato sauce is slightly - but just slightly - better if cooked for another 20 minutes or so, but of course then it's not a quick recipe.) Serves 4. If you want a more substantial dinner, while the pasta is cooking make a salad! Thank you! Agree, store bought is convenient. I wonder if they have some organic or mo healthy option? Oh my those look good! I love dill and it's not an herb I think to use often. These rolls are so simple to put together. I love having rolls with my meals! They look delicious Marina! I have never tried making puff pastry, but I have always wanted to! Whoa.. I had to look twice to believe they were made with puff pastry dough. They look wonderful! Do you have anywhere on your blog a recipe for rough puff pastry? What a great idea, Marina, and, better still, there are so many possible variations. Whenever I make ricotta for a specific dish, there's always some left over. I've always got puff pastry in the freezer and could easily whip up a batch of these rolls. And I've certainly got enough jam around here to go sweet if I like. Great minds think alike, Marina! I made the same exact rolls, about a month ago and posted it, also posted the step-by-step photo directions! Now, I want to make them again, so delicious...they disappeared so fast! Marina, mine were savory, as well! I made it with ricotta and herbs...so good; very similar to yours. Love these yummy treats...yours looks so perfect and delicious! Oh, then I should give you a credit for the inspiration! :) Be safe there in Florida! This sounds great, I love dill. As for making puff pastry I have to say I always buy it. I'd love to give it a go like you but I'd need an awfully long time! This looks like such a great appetizer or roll to accompany an entree! Making puff pastries from scratch is not difficult but a looooong and laborious process, Tried it and decided I get a great deal more enjoyment when it is made by someone else. Wow, you are really determined! Good for you, my friend! I need to loose 10 more pounds too, but I run for that, 5 miles almost every day... :) Thanks for stopping by, I missed you here! I'm with you on buying puff and filo pastry - I do as well and although I have intentions to try and make it one day I'm really not sure I can be bothered...you're good to try. I could live on bread...but I would be a big puff, too! These sound incredible! Lol, I don't think you would if you stay active. How is the weather down there? I am concerned about my blogger friends in Florida... Stay safe Diane! Mmmm... Deliciousness! I love puff pastry! I probably could eat the savory for dinner and the sweet for dessert with nothing else! Have a great week my friend! These rolls must have been a life savior during an unexpected visit! They look delicious and I am sure both versios are equally tasty!